The book is 120 pages with over 100 pages being pattern diagrams. Coaches will be able to use this book year after year. 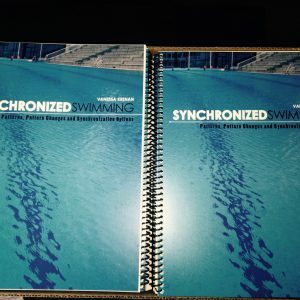 I created this book to be a poolside resource to help coaches more easily create patterns and pattern changes. There is a dedicated chapter for teams of 4,5,6,7 and 8. Each chapter contains three sections; patterns, pattern changes and synchronization options. The section on patterns includes the direction(s) the pattern may look best on. The pattern change section has examples of pattern changes with numbers to show which swimmer moves where. The third section shows different synchronization options the swimmers can perform in selected patterns. 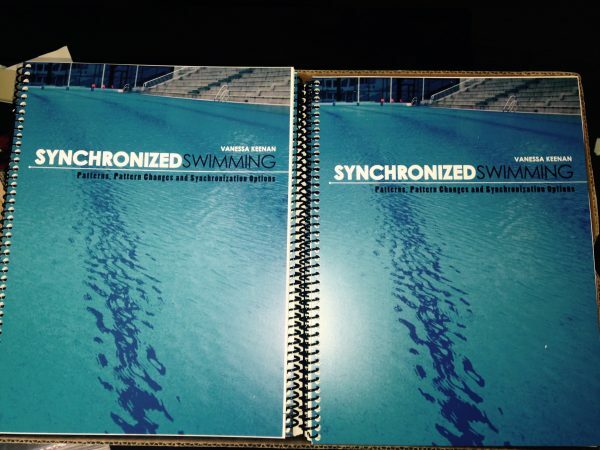 I just ordered Vanessa Keenan’s book titled “Synchronized Swimming: Patterns, Pattern Changes and Synchronization Options” for our club VPW (Vancouver Pacific Wave). Once I received the book I was thrilled with how simple the diagrams were to understand and also loved the different synchronization options. In my club, I currently have 14 coaches who are employed and coaching various programs. My goal as Head Coach is offer them as many resources as possible to assist in their growth as a coach. In my time as a Head Coach I have witnessed the difficulties that many coaches face when teaching and choreography patterns. Far too often if a coach doesn’t understand the “hows” they won’t be effective in their coaching to young athletes. So eventually what happens, is that you have a young girl moving up through a provincial program without truly grasping patterns and their importance. I love that this resource can now be utilized by my coaches to help them in their understanding and coaching. Great Job Vanessa! Keep the resources coming!!! Vanessa’s patterns book is a fantastic resource, especially for new coaches. It opened my eyes to arrangements I didn’t think would “work”. I now feel more comfortable using a greater variety of patterns as well as transitioning between them. The pages showing possible pattern transitions are by far my favourite.